Khloé Kardashian is being mommy shamed for going to Japan, and what else is new? As long as women have bodies, people will have opinions about them. Khloé Kardashian is pregnant and celebrated her “babymoon” with her sisters Kim and Kourtney by jetting off to Tokyo, Japan. During the trip, Kim debuted her new hot pink flip phone and Khloé debuted her eight-month baby bump. Instead of celebrating the countdown to the big day, the internet was MAD. Why, you ask? Because apparently pregnant women shouldn’t travel ever/on planes/to Tokyo (?? ), and if you ask us, the backlash was a little ridiculous. 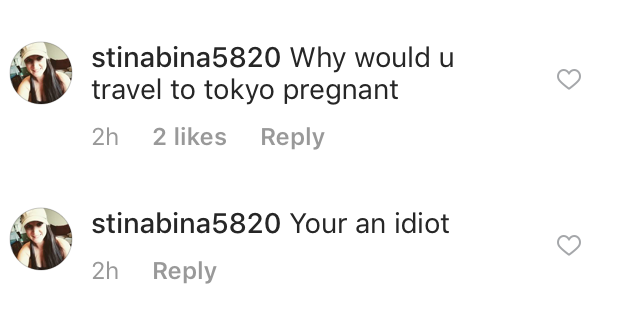 The comments on Khole’s Instagram ranged from passively judgy: “Girl you should be home getting ready for that little one” to downright mean: “Why would u travel to tokyo pregnant…Your an idiot.” UsWeekly.com reported Facebook comments like, “she’s 8 months and flying that far? Not too smart,” and also “Khloe needs to quit whining about how her painful and difficult pregnancy. She looks fine in Japan! !” The last comment is referring to Khloé’s remarks about taking progesterone supplements prevent a miscarriage. According to the Mayo Clinic, air travel for pregnant women isn’t recommended after 36 weeks. If Khloé is eight months pregnant, as she says she is, that would put her around 28 weeks. Mommy shaming on the internet is an exhausting cycle of judgment that targets pregnant woman and mothers, famous and non-famous alike. Nobody is forcing anyone or their eight-month pregnant body onto a plane. Let’s all assume that adult women know what’s best for themselves, pregnant or otherwise. Cool? Cool.